CNC machines are quite different from robots. A typical CNC machine can possess anywhere from 10,000 to 20,000 parts. That leaves a lot of opportunity for parts to break down. According to experts at Radwell International, catastrophic servo and spindle failure can occur if a machine is not properly serviced. While repairing broken-down CNC machines is always an option, keeping them running properly will help reduce occurrences of downtime, and the headaches that come with them. Since all Plant Engineers would prefer to avoid machine downtime, it is critical to properly maintain your CNC equipment. So how can unnecessary repairs be avoided? A combination of preventive and in-depth maintenance, along with a foundational understanding of a machine’s limitations will certainly help. One of the most important steps to take is practicing preventive maintenance. 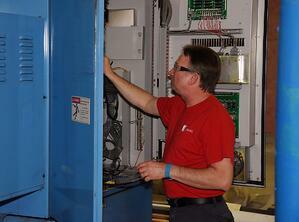 This is the routine maintenance that keeps a machine running and prevents larger issues later on. The lube and air filter on a machine need to be checked weekly. The lube needs to be properly stocked in the machine so there is no lube build-up, which can cause it to break down. It is also important to make sure that the machine has the correct lube. Misuse of lubricating oils can be disastrous for operation. Another important preventive maintenance step is checking the air filter. This keeps the machine from overheating and ensures that enough air is getting to the machine. Cooling fans and filters need to be checked once a week or every other week, depending on where operations are located. Make sure that the machine is cool, especially in facilities located in warmer climates. Overheating can occur and lead to break downs, which can damage company efficiency. Preventive maintenance can occur on a weekly basis, whereas more in-depth maintenance needs to be conducted monthly or bi-monthly. One in-depth maintenance measure is having equipment checked by an electrician every month. An expert can find any small or hard-to-spot problems that a daily operator may have missed. An electrician can also check for stress wiring on a machine and make sure that everything in the machine is balanced. In addition, recruiting the help of a machine expert to check over the machine every month or so to make sure that there aren’t any issues or that there aren’t warning signs of machine failure can be of great value. The most important consideration for facility engineers and operators when it comes to owning a CNC machine is understanding how the machine operates and its limitations. The biggest mistake that an inexperienced CNC machine owner will make is overworking the machines. 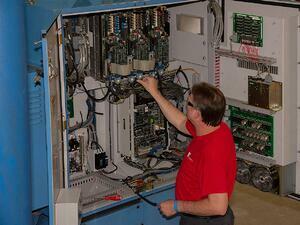 Radwell experts have seen machines that should last 20 to 30 years break down after five years due to overworking. Pay attention to a machine’s needs and operational limits. While pushing a machine to operate as quickly as possible seems beneficial because of increased production, it will cost way more down the line when the machine inevitably breaks down. Despite precautionary measures, machines will still break down, whether from an issue caused by overworking or just from daily wear and tear. 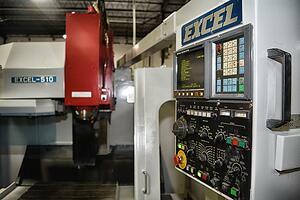 For any CNC machine issue, seek out the help of an experienced engineer. A team of Radwell engineers can be deployed to your facility for assistance with issues such as on-site PLC programming, machine repairs and equipment installation. Engineers will identify the problem and provide steps to prevent it from occurring in the future. One added perk of repairing with Radwell is its rigorous testing process. The company offers extensive real-life testing on machines brought in for in-house repairs to guarantee that the machine is up to factory specifications. For example, the company will be able to tell customers that it ran a drive in its machine for four hours before providing an answer or returning it. Radwell offers a two-year warranty on all equipment, so if your machine breaks down before the warranty is up, they will fix it for free.